Suppose that Britain were to become uninhabited. The green fields that we know and love would soon be things of the past. Scrub would begin to spread across the land. First there would be those primary colonizers, birch trees, and other trees would follow. Soon most of the country would turn back into woodland. Woodland is natural in many parts of the world, including Britain, and some cultures have based their gardening cultures upon trees integrated with vegetables. 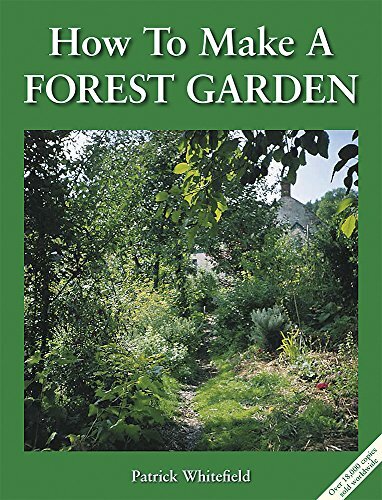 Forest gardening, as it is known, is a way of gardening in harmony with nature and is growing in importance. Many of us love a lawn, but a perfectly manicured lawn free of weeds and dedicated just to grass is a luxury that in certain parts of the world is becoming impossible to sustain for several reasons. The first is that pure grassland is not natural outside prairies and savannahs, so you are working to create an artificial environment. Secondly, working thus against nature takes up more energy than working with it, for you need lawnmowers to be used regularly, using up fuel. Thirdly, in some countries water pressures are probably going to see the end of lawns. This will not occur in my native area of North West England, but in parts of the South East, which with global warming will become more drought prone, long established lawns may be under threat. The driest county in England is Essex, which gets much of its water from rivers passing through and reservoirs in neighboring countries, and in this Eastern county many pundits predict the end of lawns as climate change increasingly affects the island. I cannot gloat, as the North West is predicted to become more stormy in Winter. Finally keeping lawns free of weeds is an onerous task. Working with nature is always easier than going against it, it uses less energy and takes up less time. There are alternatives. Some gardeners are thinking of the Mediterranean Garden. In this style much of the ground is mulched with stone or paved, and the plants are in containers or small beds. But this kind of garden contains a limited number of plants in relation to its space, and is best applied in a courtyard. If you want a more expansive garden a forest garden may be the answer. A forest garden is based on layers of plants. There are different kinds of trees, large, medium and small, along with a shrub are layer. There are vegetables, roots and climbers. All plants are designed to be complementary to each other and the whole garden has a vertical as well as horizontal dimensions. In smaller forest gardens the larger trees may be omitted, but in some countries there may be a more complex tree structure. 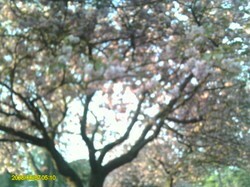 Gardens like this are not purely ornamental, in fact they are primarily economic. In some countries forest gardeners meet their supplies of wood from the trees that their plots grow, and they feed themselves on fruit and nuts, along with vegetables from the plots.Of course, gardens of this complexity are often of significant size and may be akin to a large allotment or a smallholding. Wenlock Edge is a heavily wooded area of Silurian limestone, a thin ridge in the Western county of Shropshire, where many years ago Robert de J. Hart came with his mentally handicapped brother to establish a farm where he could care and live according to his own principles. Hart's brother could do little or nothing, so the farm, smallholding really, was run by Hart alone with some hired help from a local man, whose powerful build compensated for Robert's light frame. Robert had five acres, four of which he ran as a conventional farm, keeping cattle and chickens on the slopes that ran up to the ridge. But he kept an acre or so for his self-reliance project. Here he established his forest garden. 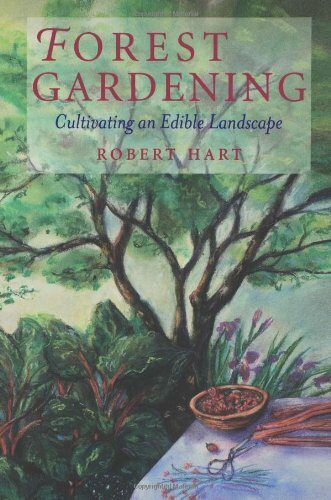 The area nearest to the farmhouse was retained as a home garden, where Robert grew the salad vegetables that he used as part of his vegetarian diet, and which he could pick on a quick dart out of the kitchen. Nearby was a pond and a bog garden, in which he grew cranberries. Nearby was what he called an anteforest garden, which grew plants that required full sunlight or acid conditions and which therefore were alien to forest conditions.Near the house were herb beds and there were at two places in the garden raised beds, whose characteristically warm soil in Spring allows vegetables to get an early start. There was also a winter garden, where Hart grew the vegetables that he and his brother would consume in the cold months of the year. There was later on a patio garden, as he wanted to show town dwellers who came to study his project that you could grow vegetables anywhere.His vegetables were often deep rooted perennials, as he realized that such plants draw water and nutrients from the subsoil and thus require less care than the more shallow rooted annuals. Yet his pride and joy were three areas of trees, which mainly grew fruit and nuts. There was the main and the second forest garden, and also an arboretum where he grew specimen trees that interested him, such as shagbark hickory, a great nut producing species, mulberry, walnut and gingko biloba. There was also an osier coppice. This was a long standing patch of ancient willow, whose coppiced stools he annually cut for basket making. Furthermore, he preserve what he called a wildlife area, which was a patch of ancient woodland containing venerable old oak. Along this ran an ancient pack-horse trail, gouged by centuries of feet into a hollow way in the Shropshire soil. Around one oak he kept a circle dancing area, for use at festivals. An addition to the horticultural practice in Britain were his hugels, three of which were near the house and a larger one was at the end of the garden. These are mounds on which vegetables are grown. They are a kind of raised bed without sides, and he used them to demonstrate gardening possibilities to visitors. Forest gardens are known in Kerala in India, parts of Africa, such as Nigeria and Tanzania, and among some Amazon peoples, all of whom thrive on their forest gardens without any intrusion from Western farming practices. Trees come in several layers, not all of which are needed in every garden. Large, medium and small trees have their place, and they each form a layer of the garden. The large and medium trees are often used as sources of wood, and are cut down in succession as and when the owner decides. Critically important to this process is replanting,so as to ensure that the stock of the forest garden is not slowly depleted. Fruit trees of various kinds make up the smaller layer, and below these come shrubs. These are used for fruit and nuts.Below the shrubs are bushes, invariably used for fruits, such as blackcurrants. Robert Hart used larger trees as canopy, and did not have the full range of layers, and with some exceptions most of his trees were fruit. In Hart's case we are dealing with the temperate forest garden, whereas the more complex structure outlined in the previous paragraph is a more tropical structure, possibly of a larger size than Hart's. This shows that there is no "one size fits all" rule to forest gardens, for they vary according to area and the area of land available to the grower. Part of the tree layer was vertical climbing creepers and vines. In some countries there could be a wide range of plants that fit into this category, but in temperate climates beans, nasturtiums and roses, which can be harvested for their hips that are used to make rose hip syrup spring to mind. Grapes might work in this category, though in my area growing grapes outdoors is pointless. Three layers lie below the tree level. There is the herbaceous layer, plants that grow above ground, like cabbages and kale, along with many herbs. There is below them a ground cover layer of creeping plants, such as dewberries and creeping herbs. These serve to not only provide food but also protect against weeds by competing with them. Though in the forest garden some weeds, such as ground elder and dandelion, would be considered edible, as would nettles. The final layer is the root layer, for vegetables such as potatoes and turnips. Carrots would fit into this layer, but they would be more productively grown in the raised beds, as they are delicate. Note that there is no place for cereal production in forest gardens, which requires a grassland style environment. . But animals could have a place, for chickens could be kept and turkeys like trees to roost in, and pheasants could be a useful and edible element, if you are not vegetarian. 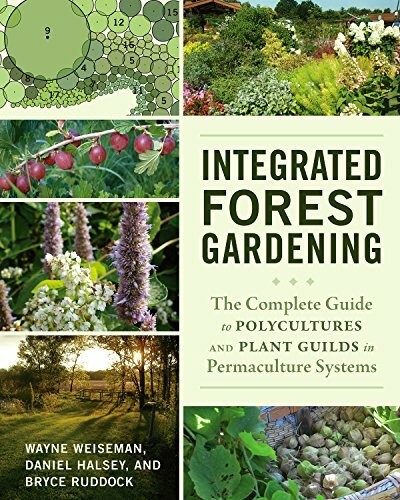 Forest gardening is a key element in the ecologically harmonious system of Permaculture, which believes in cultivation in harmony with nature. 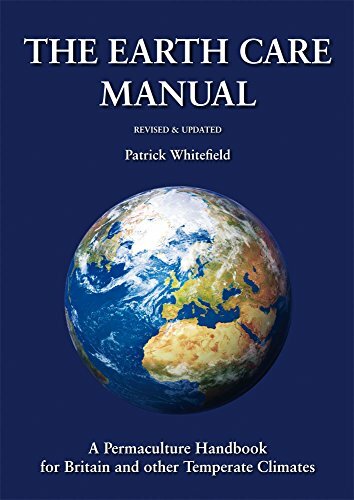 You will note that I have listed some books by the noted Permaculture teacher, Patrick Whitefield. Patrick, who gave me my first course in Permaculture, died this year, 2015, aged only 66, and the whole Permaculture world feels the loss. However, personal feelings aside, we must emphasise that the Western way of cultivation is dying. For too long we have relied on expensive oil based fertilizers, and we have used weedkillers to which weeds have developed increasing resistance. Movements such as the Organic and Permaculture movement, not to be confused with each other, have arisen to respond to the growing crisis. 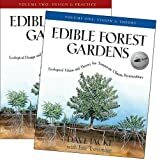 Permaculture and its bedfellow, forest gardening, allow us to use a low energy, ecologically harmonious way of cultivation, that will take little precious oil and human energy. They are pathways to the future. Thus when western companies and governments try to export the western way of agriculture to certain African and Asian societies, they are exporting a dinosaur technology doomed to extinction. Those well meaning westerners who argue that we in the West should teach "them" to farm should realize that it is the African and Asian forest gardeners who should be teaching us. The Dutch are great horticulturalists. When my son was working in a tree nursery in England his employer took him on a business trip to the plant nurseries in the Netherlands, and my son was awestruck at their size of the nurseries there. I painted my picnic table brown. There is no dominant colour in British picnic tables. I made my first foray into grapes this year, and the vine survived the winter and has grown, but it is still too young to produce grapes. There are not enough vines in my area of the country for me to know much about their fungal problems, but we do have a burgeoning grape industry in parts of the South East, which are relatively and dry compared to the rest of Britain. My son helped his employer plant a vineyard in the West Midlands, a hundred and five miles south of here, but the micro-climate there differs from the climate here in the North West. frankbeswick, What with Dutch and English grandmothers, I've loved cultivated and wild plants, domesticated and wild animals all of my life. It's so wonderful to be able to share that love with those near and dear, and your flowers, fruits, and vegetables sound just the environment for promoting and sustaining that love for natural beauty. It's also nice to hear of picnic tables amidst trees since so often they're plopped down in the middle of hot expanses of grass without any arboreal shade. The color tends to be red-brown here. What color did you paint yours, and is there a color which prevails among British Isle picnic tables? Monsanto appears to think that they can overcome the loss of French and Russian markets through expanded presence in the British Isles. As an arborist, I know that the use of any two of three strategies -- controlled burns, extreme pruning, glysophate treatments -- will stop any invasive in no more than 1 to 3 years. But I refrain from using Roundup since experience with kudzu and tree of heaven control prove that the first two work very well, individually and together. It's my understanding that it's difficult to be an organic gardener when it comes to grapes because of pesty fungi. Is that the case on the east side of the pond? I am glad that you liked it. Adaptation to circumstances is always important. A yard is not suitable for trees. But you can use containers for vegetables. I have an allotment of about 400 square yards, so I can grow some trees, but at home I have only a small yard. In that yard I have potted ornamental plants,a small grow house for seedlings and a shed. Very interesting article, Frank. I am toying with the idea of growing some of our own food, so this was doubly interesting, but our little subdivision yard won't exactly lend itself to most of the concepts here. But. the husband's family farm in Texas... well, that's another matter, with a lot of possibilities! Thanks for your contribution. Natural gardens are hard to manage, but we need to garden in conjunction with nature. The soil in conventional gardens, not managed naturally, is too rich for wild flowers, so soil management is so important if you want to establish a garden that is for all flowers. 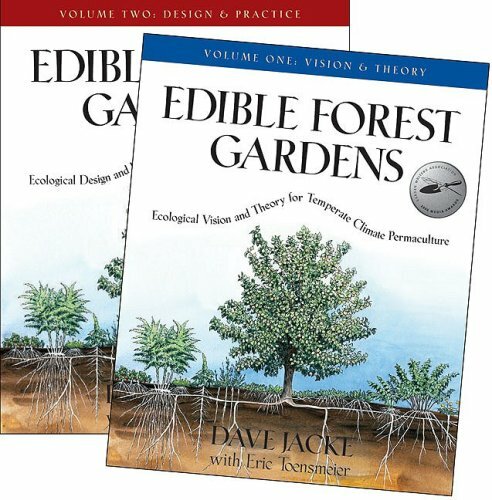 @frankbeswick - I am with you 100% on this idea of forest gardening. I wish man would refrain from spoiling what little is left of natural gardens, forests and wild areas. The Amazon deforestation is a live example; so much heavy cutting is going on illegally that the government alone is not able to stop it. I like your idea of living with Nature in harmony instead of going against it. Natural gardens can sustain themselves and need very little maintenance. Very thought provoking ideas and I like the way you have put forth examples to explain the points. Round up is already sold in this country, and I do not know whether the market for it is growing. It is generally not popular with committed gardeners, such as allotment holders, but I think it is more popular with people with large ornamental gardens. I think that some farmers use it. Your language shows that you are a true lover of nature, and your woods provide you with much to enjoy. My own plot has a cultivated flower bed, a vegetable zone and some fruit trees and bushes. I have established a picnic table in the midst of the trees so that my family can picnic in an arboreal environment. This is why I am rushing to the shower after writing this [and finishing my very British cup of tea] as I was painting the picnic table, so I am a bit messy at the moment! frankbeswick, Forests, gardens, parks, reserves, and woodlands are what I like to include in any visit at home or abroad. As much as I love the colors, fragrances, and textures of cultivated gardens, I appreciate the environmental beauty and sense of forested and wooded landscapes such as you describe. Forest gardens are every bit as enjoyable and productive as cultivated, as I know from savoring the summer's bramble berries and mulberries, chicory, and wild onions and raspberries. And it's not over, what with black walnuts beginning to fall, September bringing acorns and hickories, and October offering chestnuts. But in another direction, is it true that the British Isles may replace France as a market for Roundup? True. Originally the English laund [lawn] used grass longer than the short cut favoured nowadays, and bulbs were planted so that flowers would poke through. You are right to suggest that mosses, clover etc could form a part of a lawn. For example, there is such a feature as a camomile lawn, and a moss lawn can be very green. The idea that we need a balance in a garden is right. 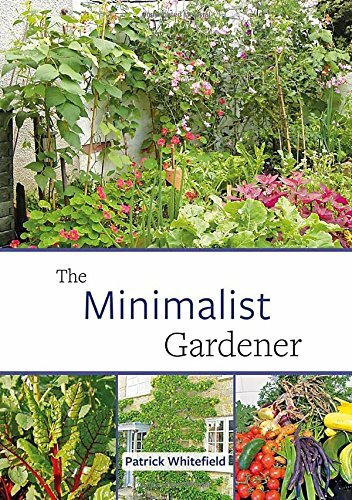 Gardening is not a return to the wild, it is a human activity which is part of human culture, but it is working in harmony with nature, as you cannot garden against it. Humans and nature acting co-operatively! Thank you, for the question about competition is a pertinent one. I suspect that the answer is that there is a human quality that has positive and/or negative aspects.